Recently I wrote a piece on why I think the best immigration policy is “Open Borders” and that got a bit of attention and interestingly enough some of my readers who normally tend to agree with me – disagreed with me. I do not exactly seek controversy (some would say I do), but I simply have to write another post on immigration. 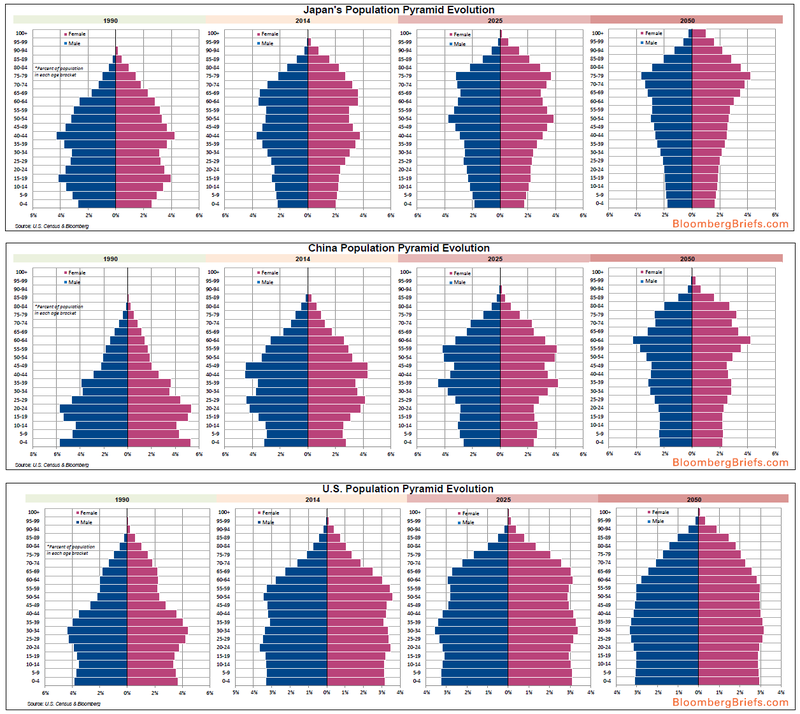 Bloomberg chief economist Mike McDonough yesterday shared some very interesting graphs on Twitter on the demographic outlook for Japan, China and the US. The graphs are extremely telling – while Japan and China are facing sharply declining work age populations in the coming decades the US is likely to more or less maintain its present demographic structure. The best looking, really, is the US, which has a nice evenly distributed population. The shape of the pyramid isn’t changing much, in part because our immigration policy keeps the population from getting too old. Joe is of course right – the US is still attracting people from all around the world to come to the US to work and live and my bet (and hope) is that that will continue to be the case in the future. Immigration is part of the American success story and will continue to be so for decades to come. What surprises me is politicians never think outside the box. Europe has a youth unemployment problem & Japan has a crushing birth rate problem resulting in a future slowdown or more concentrated use of high technology (robots) to keel their economy on a stable footing to pay for the elderly. The solution would be a 3-5 year rolling work programme where EU youth /unemployed could move to Japan to perform the work being lost to the Japanese economy. This would benefit both the EU & Japan and as it’s not fixed migration only worker (guest) status with a fixed maturity for each individual it would not alter the cherished Japanese culture but dramatically benefit the workers, the economies of both trading blocks. Japan’s politicians are thinking outside the box. Unlike their Western peers, the Japanese think the Japanese are pretty neat, and therefore they’d like to keep their country Japanese. Maybe that’s reduced their GDP a little bit. But ya know, the complete absence of looting and rioting after the 2011 Tsunami was pretty neat. Or they could reform their ossified labour markets. Or is that too radical an idea ? What’s a better predictor of country wealth (or education, or criminality, or civic mindedness), it’s average age, or the ethnicity of its inhabitants? And yet you say that the US, despite massive ethnic shifts, is maintaining its demographic structure, whereas Japan is not. And you talk about immigration’s benefits as if the country of origin is irrelevant, despite enormous evidence to the contrary. Just look how immigration (primarily illegal-immigration) has changed the politics of California. The rest of the US will be like California in the next few decades, while Japan will still be Japan (with robots assisting the Japanese). Socialism and open borders represent a classic marxist contradiction. The population of Latin America is 200% of the US population. We can admit them all–without welfare–or we can admit them all with welfare. That is what is happening in France. It results in the radicalization of the native populace, as occurred in Germany in the 1920s. The outcome of such social experiments is always very interesting. How many penniless illiterate Arab immigrants will it take before Denmark becomes Texas? Where is Denmark’s Gert Wilders? I have Japanese friends. Their #1 concern is racial purity, very much like the Koreans, whom they hate. When the Emperor visited China, they went ballistic.